WTViewer acquires numeric, waveform, and harmonic data from the WT3000E /WT3000 /WT1800E /WT1800 /WT500 /WT1600 /WT210 /WT230* Digital Power Analyzer via Ethernet, GP-IB or serial communications (RS-232) and USB. Data can be transferred into your personal computer via those communication interfaces. 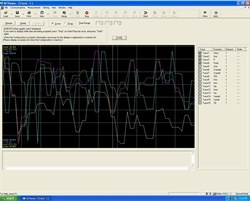 It lets you view waveforms on your computer, convert numeric or waveform data to a specified format, and store the data. *Digital Power Analyzers WT1600 /WT210 /WT230 are discontinued products. View, convert, and store data to your specifications with WT Series. WTViewer can simultaneously control up to four WT500s, four WT1800E /WT1800s, four WT1600s or four WT3000E /WT3000s for multi-channel measurement. 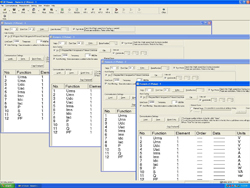 *Those four models should be same as MS code products, same type/number input elements and same options. The FTP client function makes it possible to transfer data saved in the WT3000E /WT3000 /WT1800E /WT1800 /WT500 /WT1600 internal memory to your PC. * Ethernet connection requires two straight cables and a HUB. * PC card or USB memory ( and /C5 option) is required. * /C7 option is required. */C1 or /C2 and /C7 options are required. */C1 or /C2 option is required for WT210. 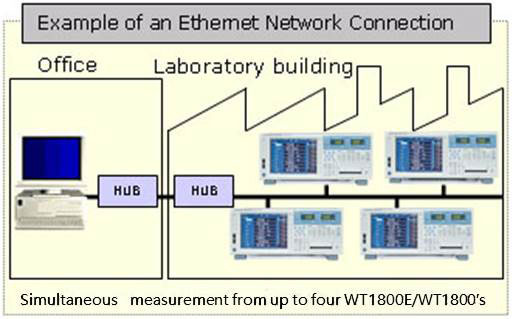 You can display the data measured with the WT3000E /WT3000 /WT1800E /WT1800 /WT500 /WT1600 /WT210 /WT230 on your PC via Ethernet/GP-IB/RS-232 communication and USB. for Sigma-A to Sigma-C(related writing setting) calculations, for simple channel-by-channel data comparison. You can capture various types of data measured with the WT3000E /WT3000 /WT1800E /WT1800 /WT500 /WT1600 /WT210 /WT230 in your PC at fixed intervals. Thus, you can view trends graphically. This feature lets you monitor power supply voltage fluctuations, changes in current consumption and other time-based variations. 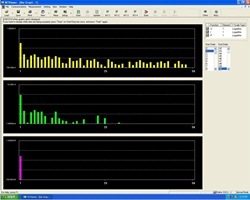 In harmonic measurement, you can see harmonic data with bar chart. It shows three items at same time. In harmonic measurement, you can have a vectorial view of the fundamental voltage, current and phase angle. This visual presentation of the interphase relationship in a three-phase power system shows the load condition intuitively. With WTViewer, you can control the WT3000E /WT3000 /WT1800E /WT1800 /WT500 /WT1600 /WT210 /WT230 main unit from your PC, including setting the wiring method, range, filter, and scaling, and so on. 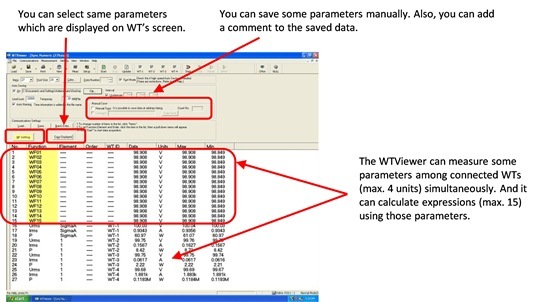 WTViewer also lets you save or read the settings of the Power Analyzer onto your PC. 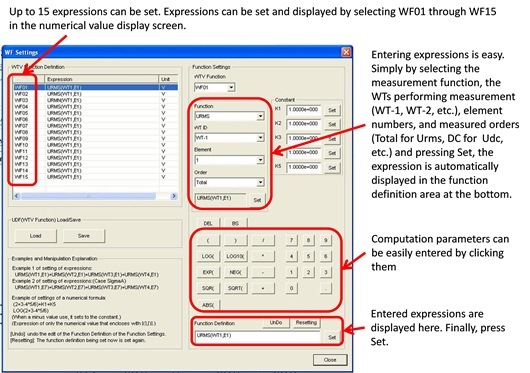 With WTViewer, you can save waveform and numeric data to your PC, while on the PC you can create *.wtd files that can be loaded in WTViewer, or *.csv files that can be imported into Excel spreadsheets. 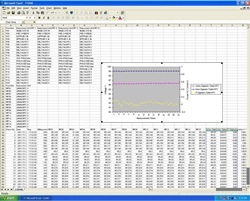 WTViewer also lets you save screen images of measured numeric and waveform data. 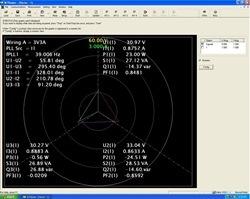 WTViewer can acquire data from up to four units simultaneously. Plus, it now includes accurate computation functions that can perform addition, subtraction, and efficiency computation of data from multiple powermeters. For example, three-phase power from the first unit (A) and three-phase power from the second unit (B) can be measured on WTViewer and subsequently used in up to 15 different user-defined expressions such as A+B, or B/A*100 (efficiency). Note: Requires that the WTs be of the same model and option code. Not supported if the WT3000E /WT3000 and WT1800E /WT1800 are combined. 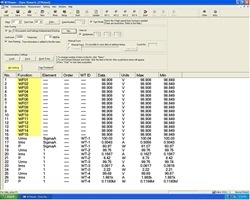 Until now, measured data acquired offline and saved to the WT's memory media could be loaded and displayed on a PC, but required running a file reader program that was separate from WTViewer. With the new version upgrade, the file reader program has now been conveniently integrated with WTViewer. Depends on your PC's performance. slower, captured and saved data can be synchronized. OS Microsoft Windows XP, Windows Vista, or Windows 7. Communications Port GP-IB: NI (National Instruments) AT-GPIB, PCI-GPIB, PCI-GPIB+, PCMCIA-GPIB, PCMCIA-GPIB+, or PCIe-GPIB with driver NI-488.2 version 1.60 or later (however, version 2.3 is not supported). Applicable Operating Systems: Must be compaible with the operating systems listed above.